MILWAUKEE – A holy water font at each door, candles, home altars, crucifixes in every room, statues and magnificent paintings of saints permeated Father Dominic Roscioli’s Kenosha home when he was a little boy. 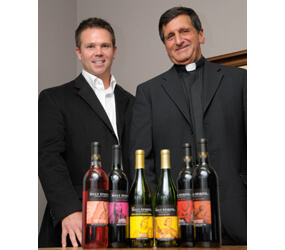 In an effort to rekindle an interest in the saints, Father Roscioli and partners Jody Becker and Carlo Pedone have developed Holy Spirits wine. Available in stores, online and in select restaurants, the wines feature saints matched with wine varietals. They began with three varieties of wine: Our Lady of Mount Carmel, St. Nick and St. Rocco. Each blend, produced by the Windsor Winery in California, complements the personality and mission of that particular saint. The label explains a bit about the saint’s life as if the saint were speaking directly to the reader. St. Nick, a third-century bishop of Myra in Asia Minor, chose a merlot because the dark blue grape reminds him of the winter sky. Wealthy, but restless, St. Rocco lived in the Middle Ages, gave everything away and walked to Rome to see if God would talk to him. His journey, he says, became his destination as he noticed many people ill and dying because of the black plague. Father Roscioli, who has volunteered for 20 years at the late Paul Newman’s Hole in the Wall camps for children with life-threatening illnesses, said sales of Holy Spirits will benefit charities and support Next Step, a program that picks up after children age out of Hole in the Wall. Early feedback on the wines is favorable, according to Father Roscioli, who has expanded the line to include wines named for St. Patrick, St. Joseph, St. Michael the Archangel, St. Joan of Arc, St. Anthony and St. Francis of Assisi. Eventually, the 12 apostles will be added to the line. Built into the $14.95 per bottle price is a donation to Next Step. Additionally, groups, individuals and parishes can purchase the wines to benefit their charitable organizations. Fifteen percent of the total profits return to the organization and the remaining profits go to Next Step and the wine company. If no charity is specified, all of the profit benefits Next Step. Another facet of the Holy Spirits collection would be the addition of juice in boxes for children, with the front of the box containing a punch-out holy card. “It would be good fundraiser for schools and the kids would learn that we are surrounded by angels and saints,” he said. While raising funds for charity is important to Father Roscioli, more important is his mission to teach that saints are ordinary people who responded to God’s grace and did extraordinary things – and that the same is true for people today. “They can be people who sit next to you at table, and have the same power for good if they respond to God’s message,” he said. More information about Holy Spirits wine is available at www.holyspiritswine.com.